Since 1994, Tom has used his entrepreneurial, leadership, and project management skills to help scrap metal recycling companies substantially increase revenues and reduce costs. Prior to founding K2 Castings in 2007, Tom worked for Schnitzer Steel Industries, formally Hugo Neu’s Prolerized New England division. He lead a $36 million modernization project of the Boston processing facility including a 9000 HP ‘mega’ class shredding machine. Prior to that, Tom oversaw operations at the deep water port and the northern New England region. Tom’s recycling experience started when he was a kid playing at the auto wrecking yard owned by his friend’s family. Growing up in his father’s machine shop, he sold shop turnings, shavings, and borings for the fun of it. When he got serious about it, he joined David J. Joseph as a ferrous broker, working with steel mills, foundries and scrap processors. He moved on to run a shredding facility for DJJ, later working as a regional VP. During that period, he was involved in construction and overhauls with shredders, non ferrous separation, landfills, and industrial contracting. Since then, Tom has worked on several shredder installations, renovations, and relocations. Projects include shredders, non ferrous sorting systems, storm water systems, civil improvements, offices and maintenance buildings, and power generating facilities. His clients include recycling companies public and private, the Department of Defense, mining and rock companies. 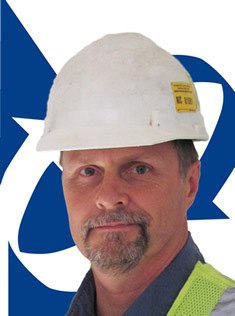 Tom’s prior experience in shipbuilding, construction, and government contracting is a plus for recycling and processes oriented customers. Tom is a U.S. Coast Guard service-disabled veteran, where he served from 1985 until 1992. He holds a BS (with Honors) in Marine Engineering from the U.S. Coast Guard Academy. In addition, he continually advances his knowledge, including advanced business management training at Ohio State University’s Fisher School of Business. Tom holds safety supervisory certifications in OSHA general industry, 1926 Construction and Demolition, and MSHA Mine Safety and Health as well as radiation safety.